It takes 40 years with $5,000/year as J.P. Morgan Asset Management showed that if you start saving $5,000 annually at 25, you’d have $1.1 million at 65. Imagine if you can increase by by $10,000. Then it only takes 20 years. If you can mange $40,000, it should only takes 10 years. In fact, a 15% savings rate is what a 40-year-old who earns $90,000 a year, starting from scratch, would need to get to $1 million by retirement. The prospect of cutting your spending by double digits probably doesn’t sit well if you are used to the lavish lifestyle. That’s why we recommend the escalating saving method. If you started at your company a decade ago, your plan probably didn’t offer auto-escalation, a tool allowing you to gradually raise your savings rate. 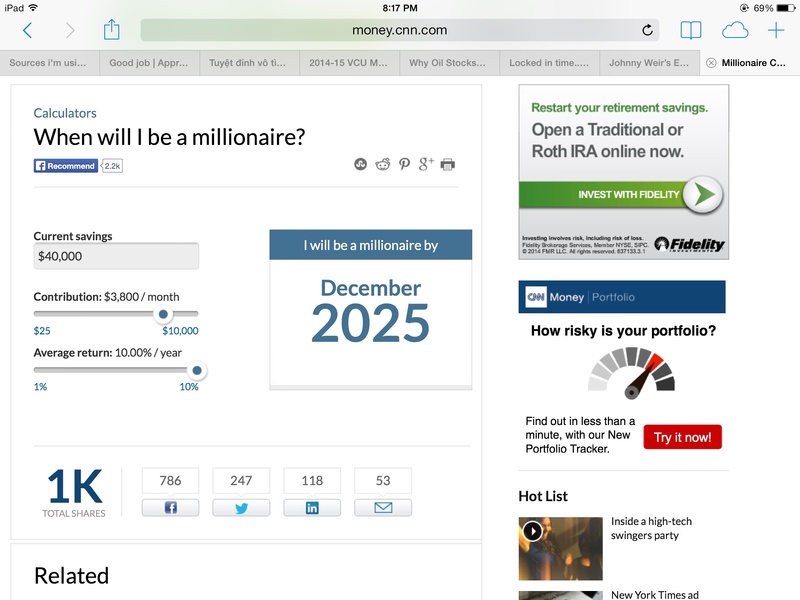 Say you get a 2-5% raise per year, don’t cash that money out, just increase your 401K retirement. That will achieve increase savings without sacrifice lifestyles. $100,000 becomes a million bucks in just over 20 years if it grows 12% a year. At 7%, you’re looking at a 35-year wait. Keep costs below average. One reason sophisticated strategies fail is they’re expensive. Even the average actively managed stock fund charges 1.26% of assets a year. Play the averages. History shows that one way to boost your returns without adding undue risk and costs is to increase exposure to so-called value stocks. These are shares of overlooked companies trading at discounts. Not only do value stocks beat shares of fast-growth companies by around 1.4 percentage points a year over the long run, but these stocks also outperformed in 73% of the rolling 10-year periods since 1979. If you own a total stock market fund, you’re evenly split between value and growth. With new money, add funds like Vanguard Windsor II (VWNFX) until value gets to around 60% to 65% of your equities. Strive to lose less than average in downturns—but in a smart way. While investors focus on scoring gains in bull markets, minimizing losses in bears is just as important. That’s why dividend stocks fair very well in the bear market. Conventional wisdom says you need a big dose of equities to get to $1 million by your sixties and to grow your money in retirement. That’s true. But what’s the point of getting near your goal if that same stance knocks you back before you retire? That’s the lesson investors learned in 2008, when two in five 56- to 65-year-olds held 70% or more of their savings in equities in a year when stocks sank nearly 40%. The conventional wisdom of letting your portfolio get conservative on its head. We recommend dropping your stake in stocks to 20% to 30% at retirement—to preserve what you’ve saved—and then gradually boosting it over time, say one point a year. The idea is low exposure to equities protects you in the first 10 years of retirement. And if returns are poor, you’ll want more equities later on to grow your money. Rents are climbing too, up 5% in the past year alone, reports Trulia. You don’t need a big portfolio of properties to make $1 million in real estate. buying a single rental now and adding two more as you go can boost your net worth by seven figures in just over 20 years. Invest prudently, and you can reap rewards in two ways: ongoing rental income plus rising equity. Steering clear of a bidding war will help with the second rule: The rent has to exceed your mortgage, taxes, insurance, and upkeep. Plus, figure on a vacant month every year or two. Aim for a 10% cushion, or 15% to 20% if you hire a property manager, which will eat up 5% to 10% of the rent (in the beginning, when you’re still young, and not have children yet, go ahead and try to manage the property yourself, join the local landlord club to get in touch with some good handyman). Betting on price appreciation and the ability to write off interest, repairs, and depreciation on your taxes to eke out a profit can end badly. Buy local – To keep down the costs of managing multiple properties, buy homes near each other or opt for a multifamily unit. Using a single maintenance team or property manager costs less than hiring pros for each house. Expenses on duplexes and triplexes can run 10% to 15% less than those on two or three single-family homes. Lock in a fixed rate. Paying cash makes you a stronger buyer. However, not many people want to get their capital locked in one place. Beside, it takes wealth to build wealth. If I can put in $115K, to get a $380K 4-plex, and have the tenants pay my mortgage and in 30-years, all of that will be mine out right?! Heck, yeah! Sign me up! If you make $100,000 and can wangle a 15% bigger paycheck, that reset will keep paying off, even if you go back to 3% annual cost-of-living raises. Bank the extra pay every year, and in a decade you could have another $200,000 saved. Some people don’t have that entrepreneurship in them. However, if you do start a business, that could bring you to the $1 mark if you’re willing to invest a lot of time into it. Whether you want to start a construction company to rehab old houses, or open a food joint, it’s one of the fastest way to reach that millions. As for us blogger, starting a travel blog should be good, you get to deduct all that airplane tickets all the excursions but you have to write about it. If you only try one or two and succeed, hey, that isn’t bad you future millionaire you! If you try and succeed with all of the 7 methods that lead to $1 million, you are stand to have $7 millions in retirement. It definitely takes hard work and perseverance to accumulate a million. Rentals have worked great for me, but I also have a solid stock portfolio. I think of my rentals as my ‘bond fund’, and the rest index equities. I think real estate is one of the solid way to reach that $1 mil mark, I wouldn’t count on betting on pharmaceutical company or winning the lottery. So, I’m sticking to dividend income and real estate for now. Many financial bloggers also disclose their failures, the one thing that consistently work for them is real estate. It looks like you guys are in the right path. Getting multiple income streams. Either pick a route or multiple route and still meet that 1 mil mark. I contribute about 30K-35K starting from last year and hopefully I would be able to get to $1M within 10 years. I will get better job with better pay and my wife will join me and help me financially by getting a part time job. Hopefully I would reach it even before hahaha Let’s see how it goes! I have no doubt you guys could reach the $1 mil mark before the 10 years with aggressive expense tracking. Goodluck. I basically follow most of the ideas on your list. It is hard to stay completely focused as life can throw so many obstacles in your way. However, pushing forward, and maintaining a steady pace is the best I can hope to achieve. Good luck. Sometimes, one has to go around in order to move forward. Growing up in poverty, I could have just take a job right out of high school. But I chose to stay in school for a long time, by the time I get out, most of my HS friend has already been establish with family, house, etc. But I caught up pretty quickly as my career would take off very fast. Going around isn’t always bad, there will always a bright side to thing.